As part of Premier Windows series debunking some of the myths that surround window and door replacement Gary Warby, Director explains what you need to know if you’re going to fit your own windows and doors. This may appear an unusual blog subject for a company that earns its crust supplying and installing windows and doors but the answer is ‘yes’ you can fit your own windows and doors, if you’re fairly handy and most importantly get your measurements right. Where it tends to go wrong is if you hit a snag – and there are many for the unwary, there are many potential pitfalls. Measurement – it’s key. Windows in the UK are made to order from the measurements that the surveyor supplies. If you’re doing it yourself, it’s on you to get those measurements right, get it wrong and you could face a world of pain. Our surveyors have decades of experience between them but even then, mistakes are always possible. Not only do our survey teams double and triple check everything they do, but our installers also measure the new window against the old and the aperture, when they get to site. This is a really good tip because once you rip a window out, there’s no going back. As a general rule of thumb, you need to measure a frame so that it’s around 10mm smaller than the frame opening. This will give you room to get it level. If you’re determined to go it alone, your choice of window supplier is going to be key. Good suppliers will help you to dot the ‘i’s and cross the ‘t’s on order forms. They’ll also be able to talk you through the different options for your new energy efficient windows and doors. Premier Windows offers a full range of secure, low maintenance and thermally efficient windows and doors from Profile 22. Designed and manufactured here in the UK, they’re the product of millions of pounds of investment in energy efficiency, security and system development. Energy efficient and low maintenance PVC-U, they feature a thermally efficient outer frame featuring six ‘honeycomb’ chambers and five chamber sash, plus an energy efficient recycled composite material reinforcement. With deeper drainage channels carry water away quickly, they also feature 10mm cover on weather seals stopping draughts. Combined with energy efficient double and triple-glazed glazing options featuring warm-edge spacers and low-e coatings they achieve achieve WERs of up to A++ and U-values as low as 0.8W/m2K. While they also feature lots of other benefits, for example thickening of frame walls to provide a better fix for hardware and locking mechanisms. But do they look very different to the untrained eye? Well we would hope that the quality and finish would show through but it’s easy to be blinded by cheap discounts and promotions. You get what you pay for. Let’s keep things positive and assume that you’ve got your measurements right, you’ve found a good supplier and ordered a good window system and its been delivered on time. You now need to remove your old windows. As we have mentioned, double check sizing of new windows before taking out the old windows. Once you have done so, remove the glass. Taping this so it doesn’t shatter or applying a safety film, makes this process much safer if removing single glazing, while double glazed units should lift out after removing beading. If they’re timber frames, the easiest way to get the frames out is to cut them in the middle on each side. This sets a limit on the amount of force you apply, which makes damage to brickwork and the window surround less likely. If you’re replacing old PVC-U windows, simply remove the screws and do the same. Take care, however, to avoid damage to internal plasterwork or tiling. Our fitting teams have fine-tuned the removal of windows to minimise damage. We’d recommend a light touch and pre-cutting plasterwork around the frame. Even then damage can occur so expect remedial work. Spacers are small plastic inserts used by professional window companies to help to get windows level and sitting within the right place within the window or door aperture. This is key because if the window isn’t level opening sashes won’t work properly, invalidating any guarantees and shortening the life of your new windows. Packers also have an important role in supporting the window frame within the aperture. It’s is important in making sure that you don’t accidentally pull the window frame out-of-square or damage it by over-tightening screws, as you fix the window to brickwork or timber. It’s also important to make sure that glazed units sit on packers rather than directly in the channel as this can impact on how effectively your window will drain. 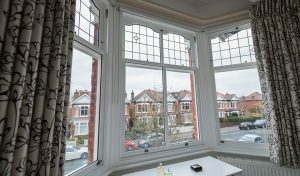 Windows in the UK are supplied unglazed to make them easier to handle. To glaze them carefully remove glazing beads and ensure that the units sit on packers as highlighted. It’s also important that the window is properly braced so that the sash doesn’t drop when opening and closing. Imagine a 5-bar gate – this uses a diagonal timber to give gate structural strength. The only real difference is that in a window, the glass unit as well as being something that you look through, fulfils a structural role. This is called ‘toe and heeling’. What you’re doing is essentially packing out the window to create (if you could see it) a diagonal loading or ‘brace’ across the glass unit into opposite corners of the frame. You should always pack from the top of the lock side first and then the bottom of the hinge side. You may want to use a specialist glass shovel for doing this. It’s made much easier with experience but getting it right is important, otherwise there’s a risk that your sash will drop over time. Finally knock in your beads with a nylon hammer, fill gaps and seal and you’re done. Well that’s the theory anyway! You will need to get your local building control office to sign-off the work, or else it could be a nightmare when you come to sell. As a UKAS accredited installer and member of a Competent Persons Scheme we don’t have to do this as we’re qualified to self-certify our work. Fitting you own windows can turn into a nightmare. If you get the measurements or order wrong or don’t glaze it properly, let alone re-plastering if things get damaged. You also don’t get any redress or comeback. It’s very easy for a supplier to argue that window failure is down to the quality of fitting, if you don’t have a track record in doing it. Yes, you can fit your own windows – but unless you’re qualified to do so, you shouldn’t.